The code examples can be found here. Do what you will with it, but as always, no warranty for you! Sweet sweet abstraction. Its a pretty powerful thing, right? From a clients perspective everything is nice and tidy, while all of the nasty not so pretty details are tucked away under the covers. And as we all know, in statically typed languages, the king of abstraction is the mighty mighty interface. But it might surprise you, that with the ASP.Net Web API, you cannot use interfaces as parameters to your action methods (say what!!!!!). To be fair, if you think about it, it actually does make sense. After all, how can model binders and formatters possibly know what concrete type you want when they encounter an IFoo interface at run-time. In fact, if you try it, the formatters wont even try, resulting in a lovely null reference exception somewhere down the stack. So if you wanted to do something similar to the code snip below, you are out of luck my friend. So why doesn’t this work? Again, because the JSON formatter cannot determine the desired run-time type of IFoo you want, it simply skips it. And as a result, you will be left with null. Like I said, its very sad, but it makes sense. So, what can we do to support this? At first glance it may seem like simply plugging in some good ol’ inversion of control might be the answer. After all IoC fixes everything, right? For those of you not familiar with some of the extension points of the Web API, let me explain how leveraging IoC might help. In the Web API’s Global Configuration there is a DependencyResolver property exposed. OK, let me first say that I know most of the cool kids hate on Unity. But hey, I don’t wear skinny jeans, I still have a PC, and I have grown used to the judgmental glares I get at my local coffee shop as I proudly play with my windows phone. That said, for simple no frills IoC support I still think its a really nice option. So with some help from the great NuGet package we are going to set up our Web API to use unity as our dependency resolver. First run the NuGet package, here are some details on the set up. Once Unity is set up, we need to configure our container like so. Nothing too fancy, just a simple registration stating that when a controller constructor asks for an IFoo, it should get an instance of type Foo. Additionally, you can see that I am setting the DependencyResolver configuration option I mentioned above to the a new instance of the UnityDependencyResolver supplied by the Untiy.WebApi Nuget package. This is what does the actual work of resolving the object instances from the container. With these changes our IoC configuration is ready to go. And god willing, when our controllers are created any dependencies they declare will be resolved by way of our unity container. We have a Foo Instance! While setting up IoC this way works great to resolve interface types when our constructors ask for them. It does nothing to help us in our action methods. The image below shows an http post to our Foo controller. As you can see we end up with a null, not a Foo. OK so how can we leverage our IoC container setup to resolve interface types in our action methods. As it turns out, for that we need to look for extension points within our configured formatter for a solution. While the Web API’s Dependency Resolver will help us with constructor injection, it does nothing to help us with our action methods. For that we need something a a little different. For those of you who want a wonderful explanation of model binding and formatters: read this, its a great article. Looking at our problem it turns out that JSON.Net has one very slick extension option that can help us. And that is the Custom Creation Converter. Much like our dependency resolver gives the Web API the ability to do constructor injection, Custom Creation Converters give JSON.Net specific instructions on how to create object instances during the deserialization process. So when JSON.Net is walking down our object graph, as it finds interface types, it will look for a configured Custom Creation Converter to delegate the object creation process to. This allows us to explicitly influence how objects are created when specific interfaces are found during the model binding process. Here is the code for our custom creation converter. And in order to tell JSON.Net to use this converter we also need to register it. Again we can use the global configuration objects for this. As you can see there is not much to this at all. First we simply derive from the CustomCreationConverter<T> given to us by the JSON.Net framework. This gives us two methods we need to override. First, the Create method. This method creates a new instance of our Foo object. Second, the ReadJson method. This method is called for us by JSON.Net as it reads each JSON element. There are a few things to note here. We want to return null when the token type is null. This happens when no value is supplied for the JSON element. If the token type is not null, we call the Create method to create the new Foo object. Then we use the supplied serializer instance to map the JSON bits into the new Foo object by calling the populate method. And last we return the newly created and mapped object so JSON.Net can add it to the object graph that is being created. All and all this is pretty simple, but this design has some very serious flaws. For one, it would required a CustomCreationConverter for every interface type you want to support, boo. Secondly since our converters are not using IoC, if we want to support multiple derived types, that logic needs to be put into the converters somehow, booooooooooo. So, lets tighten up our implementation so both of those problems go away. Since we have IoC all ready wired up, it is possible to create a single CustomerCreationConverter to service all of our needs. Notice in the code below, that in our override of the ReadJson method JSON.Net is kind enough to supply us with the type information for each object it is trying to deserialize. This information is precisely what we need to delegate object creation to our unity container. Lets take a look at what this might look like. As you can see, we did not have to change the code very much. In fact the only major change is in the Create method. Here we ask the container (via the service locator) to create the object instance for us, as opposed to us manually ‘newing’ up the object. We are using the ServiceLocator pattern so we do not need direct access to the container in our JSON serilaizer. If you are not familiar with the ServiceLocator pattern, here is a quick primer on it. Now that we have our IoCCustomerCreationConverter ready to go we need to register this with JSON.Net with the simple one-liner below. One thing you might notice here is that I am registering the custom creation converter to only work with types that derive from IActionParameter. This is not required but there are some things that we may not want to use our Custom Creation Convert for. For primitive types such as an int or bool, it does not make any sense to ask JSON.Net to use a custom converter. So by using this simple marker interface we can control what types are actually resolved using our new converter. So there you have it! By configuring IoC and adding a single JSON.Net Custom Creation Converter, we are now able to abstract the parameters to our action methods. This is great for testability, as well as creating APIs that may need to serve multiple clients with varying data structures. And that is a pretty cool thing! Had a great time presenting on how to Secure the ASP.NET Web API at Twin Cities Code Camp. If you are interested in my code and deck it can be found here. Or you can always check out my GitHub Account. Also if you like my presentation please give me an up vote at http://speakr.cc/. Its that time of year again. Time for our first TechMasters after dark event of 2013. If you have ever been curious, or interested in what TechMasters is all about, this is a great chance to learn more. TechMasters is truly a wonderful group. I can say without a doubt, that joining the group is one of the best things I have done for my career. Communication skills, listening skills, and being able to present a topic, be it at the dinner table, or in a meeting, are skills that are paramount to our success in both our work lives and personal lives. So if you are like I was 3 years ago sitting behind a keyboard banging out code for 12 hours a day, never really getting a chance to polish your communication skills TechMasters is the place that can help. This TechMasters after dark event features a presentation from Mike Benkovich of www.benkotips.com fame. And he will be telling all of us about ‘Speaking at Conferences’. Mikes is a seasoned speaker and has a lot of practical insight to share. Its free to go, to learn more see the link below. Team dynamics play a large part in the success or failure of a project. Often time’s group dynamics play a bigger part than the collective skill set of a team. In my tenure as a software developer, I have had the opportunity to work on teams that have had both good dynamics and nasty dynamics. And as you may have guessed, the experiences are very, very different. A team that works well together and collaborates is far more motivated, excited, and concerned with the overall quality of the end product. Sadly, the opposite is true of the team with lousy dynamics. Team members will isolate themselves, quality will decrease exponentially, and team members simply stop caring because they are frustrated. At the end of the day, your chances of success in a situation like this are essentially, well… 0. So, with team dynamics fresh in our minds, I thought it would be fun to write a not so technical blog post outlining the different personality types that I have seen as I have moved from one contract to another. I am starting with some of the negative types I have run into over time, and will publish a follow up post with the positive types. I am sure you the reader has many others that you could contribute and I certainly would appreciate hearing what you have to say on the subject! The cherry picker hunts and pecks his way at the requirement backlog only working on requirements he finds captivating or easy. What’s worse, the Cherry Picker will break down a given requirement into several smaller parts, again, only working on the aspects he finds simple or entertaining. A Cherry Picker will never complete a requirement, because his ‘definition of done’ is based upon him getting bored or confused. Because the Cherry Picker often quits working on a requirement when it becomes difficult, his behavior leads to the endless cycle of ‘defect ping pong’. Simply put, Cherry Pickers are bad. Don’t be a Cherry Picker. The BA Developer is one of the most frustrating personality types to work with. A BA Developer will find things he believes are shortcomings in a system and decide that they need to be worked on right now. Of course, they do this work without consulting the other team members and with no defect or requirement to track the work against. Because the BA Developer knows that the actions he is taking will be looked down upon, there are no design discussions or collaboration involved. In the end resulting in fragile implementations of ‘features’ that may or may not be needed. Once the BA Developer completes his ‘enhancement’, the BA Developer will contact the team member he feels will be least appalled by his actions. The BA Developer will then show the perceived weak team member the changes that were made. If a BA Developer if confronted, he will claim things like, ‘I have not checked anything in, I just wanted to see how it would look’. The BA Developer cares remarkably little about the wasted time that brings down the overall velocity of a team. A BA Developer is one of the most dangerous personality types to have on a team. Trumped only by the Sneaker. The Sneaker does not care about process, teamwork, standards, patterns, requirements or quality. You may be totally unaware that a Sneaker is among you until you see their handy work with your own eyes. The Sneaker is much like BA Developer, with one key infuriating difference. The Sneaker skips the showing part, and checks in code changes without mentioning a thing! When source control fingers The Sneaker as a build breaker, and he is confronted with the problem, The Sneaker will say things like ‘well I mentioned it’, or ‘I talked to this person or that person’. You should fear above all other personality types The Sneaker. The No Google-er seems harmless at first, even though they are very annoying. When faced with a problem, the first instinct of a No Google-er is to ask whoever is close by. Overtime, if other developers allow this to continue, The No Google-er actually forgets about the vast resources available to us by simply using www.google.com. Almost as if they are in complete denial that a thing called the ‘internet’ exists. The No Google-er not only wastes other team members time he is responsible for a disproportionate percentage of defects reported, a problem that is seriously compounded around holiday season when their human search engines are out of town. The Watcher is a strange personality type whose motivation is as elusive as it is unpredictable. The single trait that all Watchers have in common is that they will hold others up to standard they refuse to follow. A Watcher is the first to comment about other developers non-standard development practices while ignoring broken build notifications they caused. Those who can do, those who can’t watch. The Waiter is harmless enough though they are terribly frustrating. Waiters are extraordinarily common and come full of delightful catch phrases like, ‘we are kind of low on work, so I did some online reading’, or the classic, ‘I am waiting on ______’. Oh and I would be remiss if I forgot the common statement of, ‘I am ready to take on something new’. The Waiter is good in that they do not do too much work thus limiting the damage they can do. However, they often times pass on work to more advanced team members out of sheer laziness by stating that the work is above their skill level. So there it is! The most common negative personality types I have run into. To be fair, I am sure I have fallen into at least one of these in from time to time. Stay tuned for the followup outlining some positive types. A question I get over and over again when presenting on the ASP.NET Web API is, “How does Authentication and Authorization work in the Web API?” This seemingly simple question is actually one of the most complex aspects of the Web API; largely because the framework ignores any formal support for it. Sure, we have the AuthorizeAttribute, but as we’ll see, this has many limitations that prevent it from being a viable option. We can rely on a hosting environment such as IIS, but this also has its limitations. At the end of the day, to address security, we as service developers need to get our hands dirty and do some actual work. The trouble is that, with a plethora of approaches out there, navigating the topic gets overwhelming very quickly. As such, my modus operandi for this blog series is to present and demystify some of the common options available. I will not cover all of them (that would take a book or twelve), but I will cover the most common solutions to the problem. The intention is to give the .NET community what I wished I had when I started working with the ASP.NET Web API. So for all of the folks out there who have asked me about the Web API’s security model and been given sub-par explanations, I hope this blog series can help clear up some of the confusion for all of us! From a bird’s eye view, the list below outlines the concepts this series will cover. The truth is, one could write a blog series on these concepts individually; but, I will attempt to distill the information in a way that is practical and still covers the essential aspects of each topic. When looking at the topic of application security, there are many factors involved. Depending on your situation, your idea of secure may be different from someone else’s. For example, the security demands on a banking system will likely be much more stringent than that on a reservation system for a hair salon. That being said, I do want to review the core concepts involved in system security. If you find yourself hungry for more; a much more in-depth summary can be found here. Confidentiality – Ensuring that only those intended to have access to your data can gain access to it. 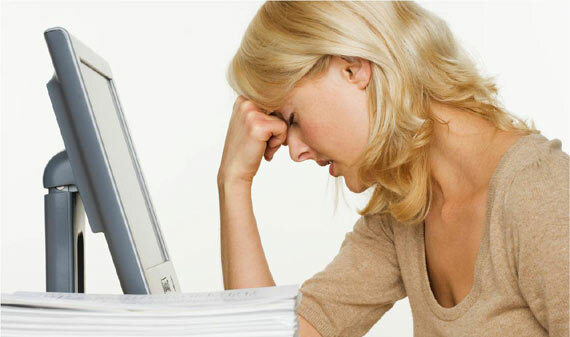 There are several other concepts involved such as Non-repudiation and Availability. However, I am going to focus on what I consider the core concepts and what is most often needed when building a system. The ASP.NET Web API does very little address to the security story. For better or worse it is not addressed. Much of the documentation and examples out there show the usage of the AuthorizeAttribute, or the heavy reliance on IIS to manage Authentication and Authorization. In Part 1 of this series, we will explore why the AuthorizeAttribute falls short, and how we can make some minor enhancements to our API to move to the HTTP Basic Authentication Standard. So, with introductions out of the way, let’s get started! Oh… if only the security story was as easy as adding an attribute to your controller actions, what a great world it would be. It would also be nice if we did not need to worry about security. Unfortunately, both of these niceties are a pipe dream. For now let’s play the devil’s advocate and take a quick look at how the AuthorizeAttribute works. Then we can talk about why you should never use with a production grade service. Using the AuthorizeAttribute is very simple. As with its MVC counterpart all you need to do is decorate your action method or controller class with it and BAAAM! Now you have security. Let’s look at a quick example. By simply adding this attribute to your action method, any unauthenticated requests to our Web API will reply with a HTTP 401 (unauthorized) response. Take a look at the request below to the TestController. No. Any servers between a request and your Web API would be able to see the content of the request and response. No. It does nothing to ensure that data has not been tampered with by the time a request reaches your Web API. At some level this is supported. The authentication ticket is passed from client to the server via cookies. However, these kinds of ad-hoc implementations are inherently susceptible to phishing and unless some sort of transport security is used in conjunction with cookies, credentials are sent across the wire in clear text. To sum it up, because the AuthorizeAttribute relies on Forms Based Authentication, we cannot and should not ever use it to secure our Web API. So now that we know using Forms Based Authentication is a non-starter, the next thing we can consider is Basic Authentication. Basic Authentication is a very attractive option since it is part of the HTTP standard. Moreover, as the name states it is a very simple form of authentication. Let’s quickly outline the steps involved in Basic Authentication. Here is a simple sequence diagram outlining Basic Authentication from one of my favorite tools. This simple approach does not require cookies, session, or any other type of state to be managed by our Web API. However, there are some concerns worth noting here. First, because our Web API is supposed to be stateless, Basic Authentication requires the client to send its credentials with every request. This forces the server to authenticate and authorize each request, potentially introducing some unwanted overhead depending on how your application does these things. Secondly, Basic Authentication does nothing to protect the credentials being sent across the wire. Looking at the example of the authorization header below; you may be led to believe that there is some sort of encryption going on, I assure you there is not. The value of the Authorization header may look encrypted, but it is actually the name and password encoded in Base64. This means the clients credentials are essentially sent to the server in clear text. For Basic Authentication to be viable at all, we must always use it in conjunction with some form of TLS (think SSL all the time). Let’s take a look at how we might implement Basic Authentication with the ASP.Net Web API. The first instinct one may have for an implementation might be to roll your own AuthorizeAttribute. This attribute can then be applied to any actions that you want to protect. But from a Separations of Concerns (SoC) perspective, Authentication and Authorization are completely different animals. Authentication focuses on identifying the user, Authorization focuses on what the user can do in a given system. Having an action filter responsible for both concepts goes against most core object-oriented principles. Even more troubling is how close to your action method the Authentication and Authorization would happen. If we wait until the request makes its way to an Action Filter before even Authenticating the user, a malicious request could make its way much deeper into our call stack than is comfortable. Think of it this way. Is it better lock only your bedroom door while you are sleeping, allowing burglars to make their way into your house, up the stairs, only to be stopped at your bedroom door? Of course not! A more reasonable approach would be to lock all the doors of your house, so burglars cannot intrude in the first place! Similarly, we should reject all unauthenticated requests as soon as possible, limiting the potential damage a malicious request could cause. This is where the Web API’s Message Handlers come in handy. Message Handlers are executed very early in the life cycle of the request/response pair. Message Handlers receive requests when they come in as well as the responses before they are sent back. This allows Message Handlers to inspect and reject a request before it makes its way to our controllers. Message handlers are chained together, much like a linked list, where one handler passes the request to the next. Once the last handler is executed the response is processed much the same way but in reverse. The image below illustrates the ‘pipeline’ style architecture of Message Handlers. By creating a custom message handler to manage Authentication we can inspect the request as well as alter the response, but better yet, we can do it at a very early stage of the request/response life-cycle. Let’s take a look at how we might implement this. This simple message handler does everything needed to support Basic Authentication. It checks the request for the presence of the Authorization header. If found it parses the header and extracts the username and password. It then looks up the User based on those credentials, converts the User to a Claims Principal and finally assign it to HttpContext.Current.User and the Thread.CurrentPrincipal. From there it passes execution to the next handler. Once the response comes back it checks the response HttpStatusCode for a 401 (unauthorized) status. If the response is a 401 we add the ‘WWWAuthenticate’ header to indicate to the client that they need to supply their credentials. One last thing worth mentioning is the use of the ToClaimsPrincipal extension method. This extension method converts our User object into a ClaimsPrincipal object. Click here for more information about Claims Based Authentication. The code for this is very straight forward. The only thing we are doing here is creating a ClaimsPrincipal object and adding a few claims to its claims collection. Now that our message handler is ready, we need to make sure it is executed for each request. To do this, you need to add the following configuration to your WebApiConfig.cs. With the message handler intact, it will now handle Authentication for us. However, that is not the entire story; we still have the matter of Authorization. Thankfully for that problem we can still rely on the AuthorizeAttribute as it is. When a request reaches our action method, the AuthorizeAttribute will look for an authenticated principal on the current thread. If the principal is present and authenticated, the next step is user authorization. If the current principal is authorized to access the requested action, the action will be executed, and the result return to the client. On the other hand, if there is no authenticated user present, or the user does not have access to the requested action a HTTP Status 401 (unauthorized) will be returned. With all of the moving parts ready to go, let’s take a look at this approach in action. The first thing we will do is make a HTTP Request for a protected resource. We will not include our credentials in the authorization header to get a HTTP Response with a status code of 401 (unauthorized). Looking at the highlighted lines above you can see the request to the protected resource and the 401 (unauthorized) response that was returned. You also can see that the ‘WWW-Authenticate’ header was included. This tells the client that credentials are required. When clients receive a 401 (unauthorized) response, they can send an additional request, one that contains the authorization header and the credentials of the user making the request. Let’s look at an example of this. With the presence of the Authorization header complete with the user’s credentials, the user can be authenticated, and all is well with the world. In part one of this series, we looked at a few different things. We looked at the limitations of the AuthorizeAttribute and its reliance on Forms Based Authentication. 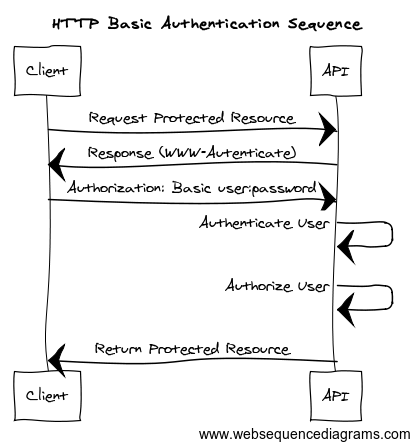 We looked at how we can support Basic Authentication in our Web API’s. Although Basic Authentication is a very attractive solution because it is both simple, and part of the HTTP standard, it does have some limitations. First and foremost because it offers no type of transport layer security using it without SSL is a not an option. If you are going to use basic authentication, make sure you do it in concert with SSL. Another area of concern is that the credentials are sent to the server with each request, which creates a potential for additional processing overhead. Finally, if your browser caches these credentials, there is some risk of Cross Site Forgery attacks. Even with these limitations, Basic Authentication is the first step to a much more secure Web API. We will take this implementation much further in Part 2 of this series, where we will take a look at Digest Authentication. Digest Authentication is very similar to Basic Authentication, but it is substantially more secure. The additional security precautions of Digest Authentication address most of the concerns that arise from Basic Authentication. Until next time keep your services safe! As most of you probably know, with the drop of the of the MVC 4 Framework Microsoft introduced us to a shiny new framework called the ASP.NET Web API. Anytime new frameworks come out open source or otherwise, you have to ask yourself a few important questions. The first and most obvious question we need to ask is “What the heck is this new framework?”. In the case of the ASP.NET Web API this is a pretty simple question to answer. The ASP.NET Web API is now the recommended approach for developing HTTP based services and REST based services in the .NET stack. See it’s simple! Secondly, and more importantly, is the question “Why did the create this framework?”. After all, we have WCF; we have MVC; so why introduce another framework into an area that is already a bit confusing? To help illustrate why this framework was introduced, I would like you to look at a few images. While looking at them ask yourself a question. Why are these people feeling so much pain? What is it that is making them look miserable? So what is going on here? What is it that’s making these folks so angry? As I look at these pictures, this is the story that plays out in my mind. This is a group of .NET developers, who for the last three years have been working on a suite of REST based services, but because of the corporate standards of the company they work for they have been forced to do this using WCF. So for the greater part of three to four years, these people have been fighting against a technology that was not necessarily designed to solve the problems they were facing. 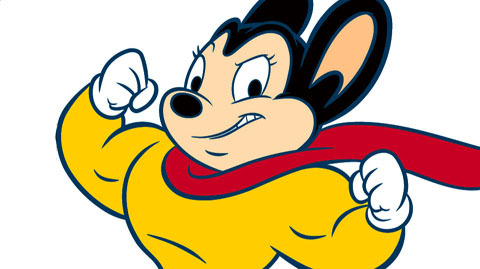 Now I don’t mean any disrespect to WCF. But the truth is that from its inception and from the ground up, WCF was designed with SOAP based web services in mind. It was developed to be highly scalable, highly pluggable, highly configurable as well as any other ‘able’ you can think of. It was also designed to work across multiple transport protocols be it TCP/IP, Named Pipes and most recently even HTTP. All this is extremely powerful stuff if it is what you want. However, if what you need is a simple HTTP service to send data to, or to obtain data from, the WCF development experience starts to feel heavy, its hard, its complicated and honestly just not much fun. Thankfully, Microsoft acknowledged this, and as HTTP services became more prevalent they took steps to make things easier on us. Enter .NET 3.5 and the introduction of the WebHttpBinding. For the first time, WCF developers could now expose their WCF services as HTTP end points. A step in the right direction? Absolutely. However, it did not quite go far enough. Relegating HTTP to more of a transport protocol as apposed to application protocol the WebHttpBinding was more a way to transfer data from one server to another then it was anything else. But the HTTP semantic is much richer than just a transport protocol. We have things like caching, etags, and many other things that have become more and more important as HTTP services have taken over the service landscape. And its these things that HTTP service developers need to be able to target when building their services. So was the WebHttpBinding a step in the right direction? Yes. But unfortunately for us it did not go far enough. Next we got something called the Rest Starter Kit. I never actually got to work with this; however, I have read that it was actually well received by many. However as it is with many things from Microsoft the Rest Starter Kit never made it past the community preview, and as such is just a blip in the .NET history book. The WCF Web API, the third and final attempt to build on top of WCF strong support for HTTP based services. In all fairness to the WCF team, this was a giant leap in the right direction. We started to see a convention a based approach opposed to the massive WCF configuration files. We were given a nice client to interact with our services, and we even started to see the support for content negotiation. However, this all fell into a category of a too little and too late. .NET developers frustrated with the lack of support for HTTP based services and with open source solutions available, things like OpenRasta, and Service Stack, .NET developers had moved on. Some of the savvier .NET folks even started to build their HTTP services on top of MVC, and even this approach proved to be more straight forward than using the latest WCF Web API. At this point, Microsoft found themselves in a bit of a precarious position, and they had to make a choice. Do they continue to push WCF into a box it was never intended to fit into or do they stop, look around at the community, and create something directly targeted at the problem of HTTP based services and REST based services. Thankfully for us they chose the latter. And with the release of Visual Studio 2012 and MVC 4 we were given the brand new shiny ASP.NET Web API. Taking the good from the WCF Web API, and what they have learned form the MVC stack. They created a new framework that brings a slew of desirable features. A much more modern HTTP programming model. Largely convention based, Asynchronous from top to bottom, we have a really nice HttpClient to interact with our services, and quite frankly it just a lot of fun to work with. Because the ASP.NET Web API is based on top of the MVC framework we get a lot of the magic that exists in the MVC stack. Things like routing, action filters, model validation and of course the added benefit of the development experience feeling very much at home if you are already a MVC developer. As service developers, we need to be cognisant of the types of data our clients want to work with. Maybe they want XML maybe they want JSON out of the box the ASP.NET Web API supports both. And of course the extensions points are there if you want to create your custom media type, or use something RSS or ATOM. If you want to expose your HTTP service to URI based queries, there is OData support for that, and it gets better all the time with the ongoing nightly builds. And last but not least the framework is testable. If any of you remember how hard it is to unit test, and integration test WCF services, you will understand why this is such a beautiful thing. Built with testability in mind from top to bottom it is one of the most testable frameworks in all of the .NET stack. The answer to that question is simple. There is nothing wrong with SOAP based services. However, in the gadget landscape of today, many devices know how to work with HTTP natively. Far less understand the different abstractions that sit on top HTTP, such as SOAP. So it should not surprise anyone that HTTP based services are the new standard. Does this mean SOAP and WCF are dead? No, not at all. WCF and SOAP just solve different problems. If you need to work with multiple transport protocols, or if you need WS-* style security WCF is still the king. Where the ASP.NET Web API shines, is in the space of HTTP. So in short, each solves a different problem, and each solves does it exceptionally well. This post is based on the nightly builds of the ASP.NET Web API. The Web API team is constantly making improvements to the framework, and publishing them with nightly builds on NuGet. Click here for more information on getting setup with the nightly builds, there is a lot of exciting things in them. I would also like to extend a giant thank you, to Youssef Moussaoui over at Microsoft for fixing the following defect. Without this fix, the IValidatableObject support outlined in this post would be much more difficult. So thanks Youssef! And finally, to get the source code for the sample application ‘ResIt’ outlined in this post, click here. And as always no warranty for you! If you ask me what the most difficult aspect of Business Application Development is, I will say, quickly and confidently, validation! Add to the mix a distributed architecture like Http, and you have the makings for a real bugger of a problem. With rules on the server, rules on the client, and a pile of plumbing code in between, there is a plenty of opportunity for things to get mucked up. Yet, despite all of this complexity, we still need to provide the user a reasonable validation experience. So all together now…Validation is hard! With the ASP.NET MVC Framework we were given lots of fancy tools to help support the validation story. Of course, we got all kinds of DataAnnotation support, and with MVC 3 we were given another option with the added support for the IValidatableObject interface. But what does this have to do with the ASP.NET Web API? Well, as it turns out it has a lot to do with it. Because the ASP.NET Web API is build on top of the MVC framework the Web API can take advantage of many of the features that we all know and love in the MVC stack. Things like Action Filters, Routing, and of course all of the goodness that is Model Binding. For a detailed description of Model Binding please look here. For now, here are the Cliff Notes. Model Binding is how form, querystring, and any other type of data coming in via the Http Request gets converted into the CLR types defined as the input parameters to our action methods. This magic allows us to work with typed .Net objects in our actions, as opposed to developers having to interrogate the HTTP Request directly. And this is my friend is a marvellous thing! Oh, but there’s more! Not only does Model Binding handle the nasty right to left mapping between the incoming HTTP Request and our .Net types. Model Binding validates our model using Model Validation, and it’s this part of the MVC stack that we are interested in, at least for this post. Model Validation is the process where the framework takes our objects already created by Model Binding and inspects their properties for any DataAnnotations. If found, the Validate method of the each DataAnnotation is executed. This process then invalidates any objects that don’t meet the business rules as defined by the supplied DataAnnotation. So why is this relevant to the Web API? Simply put, because the Web API has complete Model Binding and Model Validation support, any of the techniques we use for validation in MVC is fair game. This includes both DataAnnotations and the IValidatableObject interface. The technique I am going to outline here is one that I have used successfully in several projects. It leverages one of my favorite open source frameworks, Fluent Validation, coupled with the WEB API’s support for the IValidatableObject interface. Using Fluent Validation, we will make individual validators for each our domain objects. These validators are both explicit and testable, both traits that get two thumbs up from me. Combing these validators with the Web API support for the IValidableObject interface, we will create what I consider a pretty slick solution to the validation problem. Before we get into the dirty details, let’s talk about the sequence events we are going to look at. This image below illustrates the sequence of events using a super slick tool. Before we get into the meat of this example, I want to introduce to you our sample application. Our sample application is a fictional Reservation web site called ‘Resit’. 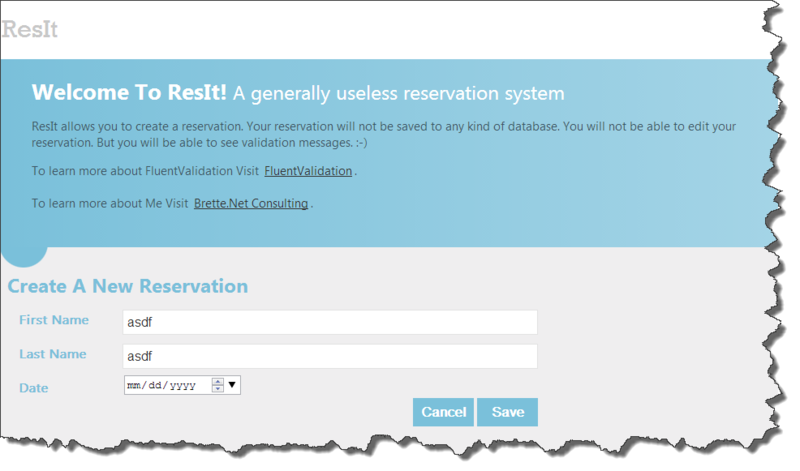 Resit is a simple application, it consists of a single screen, that allows users to add reservations. In addition to the screen, we also have a Web API that will be responsible for the validation of our models and any data access required. Finally, we have a single domain object named Reservation. The Reservaion object implements the IValidatableObject interface and leverages Fluent Validation to execute any validation rules that may be needed. Our view is nothing more than a simple Html form with the following fields. Not much going on here, just a simple HTML form taking advantage of the boilerplate MVC look and feel. Oh, and of course, the very ugly HTML 5 control that is rendered for dates automagically. Lets take a look at the code for the view. To learn more about Me Visit <a href="http://www.brette.net" title="Brette.Net">Brette.Net Consulting</a>. The first thing you will notice is the presence of our Html form. A simple little form that contains the inputs for the First Name, Last Name, and Date. Additionally we also have included the data-attributes required to support jQuery validation. Finally, you will see the empty span element that will eventually render our error messages sent back from our Web API. Next lets talk briefly about our Reservation object. This is not very exciting containing only a few properties (FirstName, LastName, Date) however one important thing to notice is that it implements the IValidatableObject interface. And if you remember our conversation about Model Binding you will know that both the the MVC framework and the Web API honor this contract when running through the Model Validation process. /// Determines whether the specified object is valid. /// A collection that holds failed-validation information. IValidatableObject gives us a single method aptly name Validate. This method takes in a ValidationContext object, and as you can see simply delegates to our ReservationValidator (a Fluent Validator) object. During Model Validation, the Web API will call this method on any object that implements this interface giving us a chance to run any validation rules for each object as its Model Bound. This class represents all of the business rules for our Reservation object. Notice that it derives from the AbstractValidator<T> class. This class is one of the base classes available to us from the Fluent Validation framework. The only other interesting thing here is the rule definitions in the constructor of our validator. Notice I create two rules, the first, requires the FirstName property to be valued, and the second, requires the LastName to be valued. The last thing I want to point out here, is a simple extension method I have added to the FluentValidation.Results.ValidationResult type. This extension method simply converts the FluentValidation ValidationResult type to the System.ComponentModel.DataAnnotations.ValidationResult type that both the MVC and the Web API expect. It’s only a few lines of code, but this is required since the types are actually different. Just a quick recap. So far we have a Simple view with a Html form, a Reservation domain object that implements IValidatableObject, a single Validator object called ReservationValidator. Based on what we now know about Model Binding and Model Validation, we know that when our form is posted to our Web API, Model Validation will call the Validated method on our Reservation object. That method creates the instance of the ReservationValidator, and all the validation rules are executed. The results are converted into the System.ComponentModel.DataAnnotations.ValidationResult object that is eventually stuffed into Model State and streamed back to our client. The last major component of our validation solution is our Web API, this is, after all what the post is all about right? Looking at the ReservationController, you know this is our Web API because it derives from ApiController. Our Web API boasts a single Post action; this action takes in an instance of our Reservation domain object, created for us by Model Binding of course. Assuming there are no validation errors, this action simply streams the reservation back to the client with a HTTP Status Code of 200 (OK), and all is well with the world. However, what happens if the incoming HTTP Request is incomplete, or if it’s invalid? How can we communicate this information back to the client? This brings us to the ValidationResponseFilter that decorates our fancy Post action. Just a quick refresher on Action Filters. Action Filters are a terrific way to support cross cutting concerns in our applications. As such, they let us execute code just before an action is executed by overriding the OnActionExecuting method. They also let us execute code just after an action executes by overriding the OnActionExecuted method. This gives us a excellent way to add aspect oriented behavior to any action by simply decorating an action method with an attribute. One important thing to note about the OnActionExecuting method is that it executed after the Model Binding process. What this means is, that by the time the OnActionExecuting method is executed, both Model Binding and Model Validation have already run. This results in any validation errors being stuffed into Model State just before our action filter is executed. Using this little tidbit of life cycle knowledge we can do something pretty slick. Enter the ValidationResponseFilter! Alright for all of my fellow Indy’s out there we all have a problem! Granted its a good problem to have, it is nonetheless a bugger of a problem. Overtime as we move from client to client and as our network grows and grows we collect a slew of side work (again a good problem). And while its great that this happens, sometimes tracking billable hours on such things is a hard thing to do effectively. Example you ask? 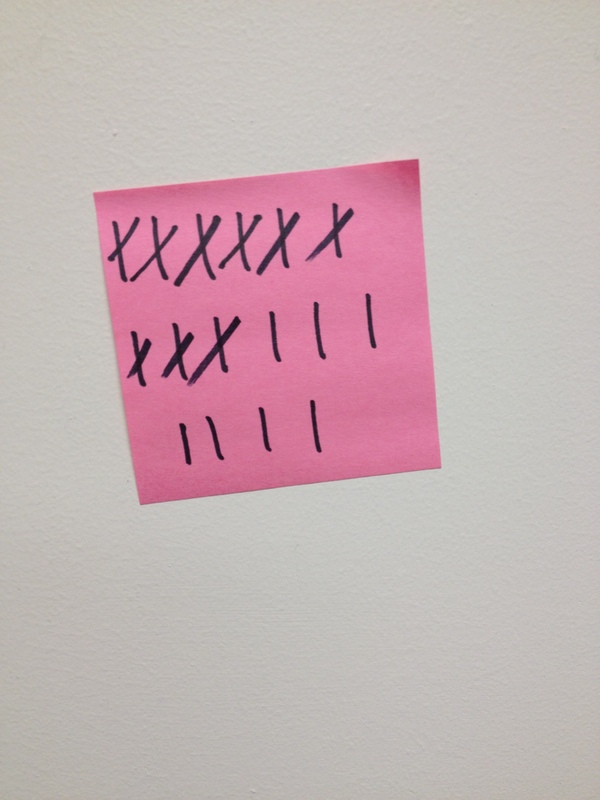 For years I had the sticky note method where I jotted down a hash mark for each hour I worked. At the end of the month I would add them all up for each client, and create an invoice. Yes I know, pretty lame. After all I write software that does things, how is it I don’t have a better solution to manage this? Now that is a question with a really simple answer, its because I am really really lazy. Developers tend to get bored quickly and when they get bored they cut corners on stuff that does not really matter. And what is more boring then tracking hours! Excluding Garrison Keillor of course. And what the heck is wrong with a sticky note anyway! After all my trusted sticky note has never failed me! It works, its simple, and excluding the few times the cleaning lady has tossed it in the trash (oh yeah I said cleaning lady!) it has been a solution that was just good enough to last. Much like ITunes. Enter 2013, where my wife Pragya and I have agreed that we are adults and that sticky note accounting, well its not really a great way to understand where time goes. And to be frank there have been times where I have missed a few hash marks as the 3am blur overcomes me. So as I thought to myself, how can I solve this problem? The developer inside screamed “just build it to fool” but the lazy part of me said look for a free solution first. So that is what I did. And I was happy as a clam when I found the long over do solution to this problem! A wonderful tool called Toggl. This site is so simple and its the perfect solution to my ‘sticky’ problem. Simply push a button to start work, and push a button to stop work. When you stop it you can tag that session for a client and at the end of the month use the reporting features they have to see where your time has gone. Its brilliant! It’s just what I wanted and needed, and almost built myself! So what have I learned from Toggl? Well first of all I work a lot more than I bill. Almost 50% more in fact! The developer in me says ‘that simple text change is a 10 min thing’. But as I used Toggl I soon found out I was sadly mistaken, those ’10 minute’ sessions are usually about 20 to 30 minutes. Add that up over time and that 50-60% adds up to real cash. But that is not worst of it! This underestimation leads to some serious problems such as over allocating yourself. Committing to more than you can accomplish does nothing for you. It hurts your relationships with your very valuable customers, it hurts your personal relationships, and it hurts your health because you feel like you are being pulled in 500 different directions 38 hours a day. So using the information you can get form Toggl is not only better than sticky notes, its better for your health! For those of you who will be attending my talk on the ASP.NET Web API at this Wednesdays St. Cloud .Net User Group you can find the code files for PittyLove.org here. For those of you who will be attending this Thursdays edition of the Twin Cities .Net User Group you can find the code files here.